Last edited by Elizabeth on Thu Nov 29, 2018 7:32 pm, edited 1 time in total. Apparently the Junior GPF events will also be streamed on the ISU Junior GP YouTube channel with Ted Barton. He just announced that Meagan Duhamel will be joining him on Thursday. She's coming directly from New York where she and Eric performed at the Bryant Park Christmas tree lighting. So incredibly excited to be working with CBC for the Live Stream and Facebook Live for the GrandPrix Final tomorrow. Listen to the amazing @skatingpj and myself at 10:45pm for the Men’s Short and 12 a.m. (midnight) for the Ladies Short Program. Hope you will catch us on air. 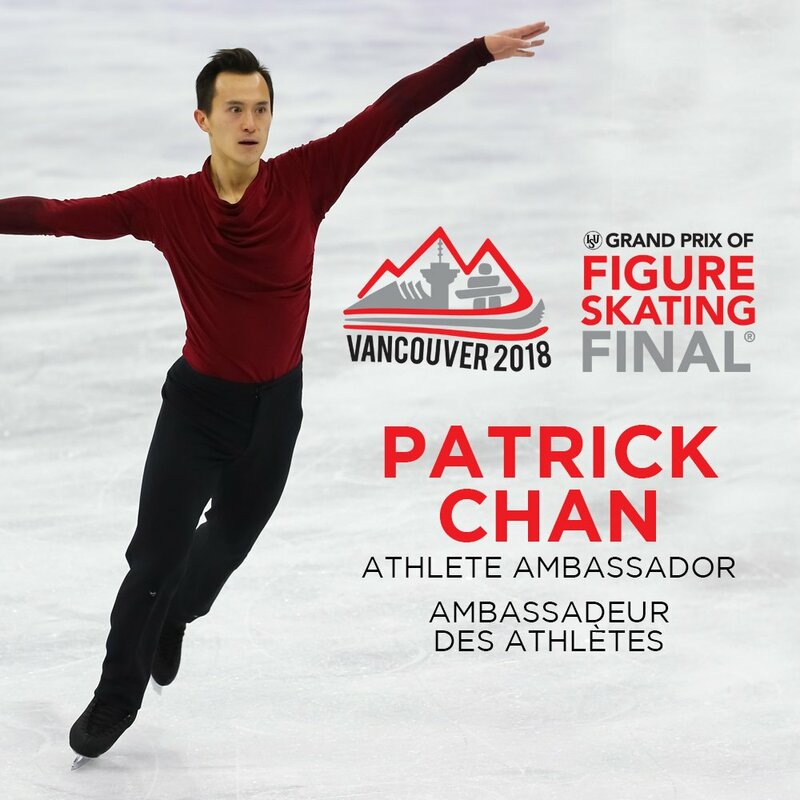 Apparently PJ will be joined on the seniors live streams by Asher Hill (dance) & Dylan Moscovitch (pairs) in addition to Liz Manley - she mentioned this in the preview with Tony Wheeler. Another debut of my music today! If you’re at the #gpf for the opening ceremonies you will get to hear my new piece. Would appreciate any reports on how it sounds in the big arena! The links in the second message, above, say the live coverage will be starting in ten hours. Thay might be around 7 o'clock Atlantic time, where it's 9:20 now; 8:2- Eastern Time... A half hour later in NFLD. I never know idthat's a half hour later than the EST or the AST. The CBC website adjusts to your timezone, I believe, Fred. 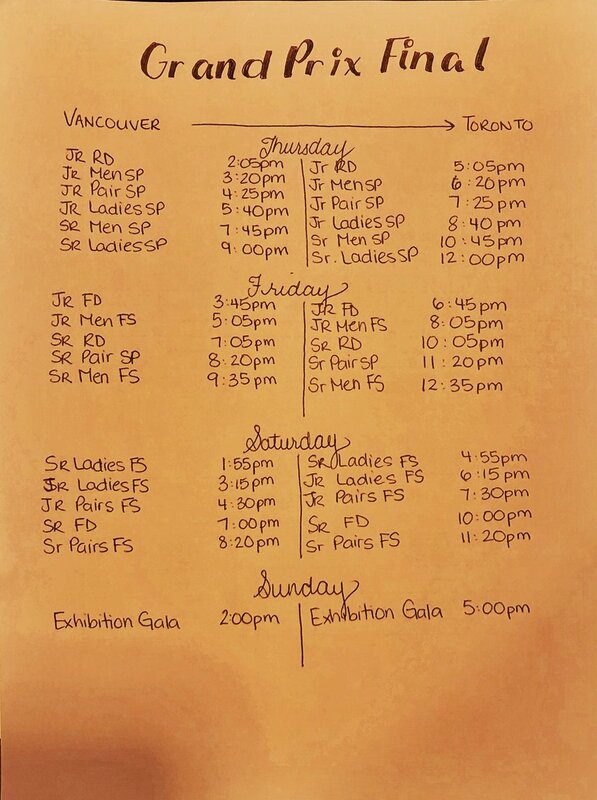 The competition is taking place in Vancouver - 4 hours behind AST; 3 hours behind EST. Oh, that's nice. I'm on a push to finish my book and don't have travel time or money, but I'm glad board members are getting together for events. Hi to all. 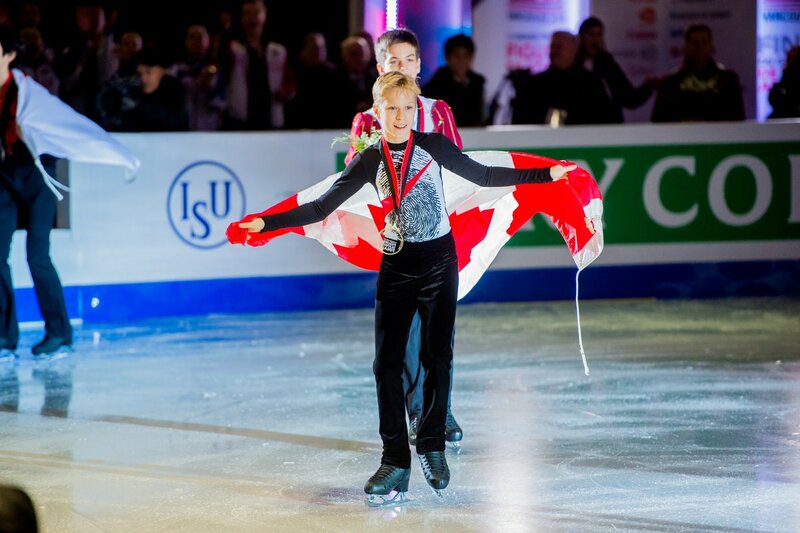 Congratulations to Stephen Gogolev who went into the GPF as an alternate and won a gold medal!! Well, young Gogolev seems to be doing alright. Now that's the way to annpounce your carreer! We'll look forward to watching you,... but no pressure! Do you think that might have impacted the results of the ladies event? From what I remember (and that is still sketchy from all the excitement of being there live) her skate did not seem to be hampered by an injury. She is a spunky woman, but it is worrisome that the skaters try to skate at any price through injury which might come back to haunt them later on. See Yuzuri. I am still so happy I attended this event and making new friends, including board members and "lurkers".Thank you All. Hope to attend more of those competitions in the future. I am still so happy I attended this event and making new friends, including board members and "lurkers". Thank you All. Hope to attend more of those competitions in the future. In other skating news following on from the GPF, Elizaveta Tuktamysheva is reported to have pneumonia and will be hospitalized for 2 weeks; missing the Russian Nationals!! That is too bad for Elizaveta Tuktamysheva, especially missing their Nationals. It is such a competetive field. I read an intereview with Alina Z. where you could read between the lines how "friendly" or not these women are among themselves. Sorry, it was on my cell and I have no idea how to post it here.